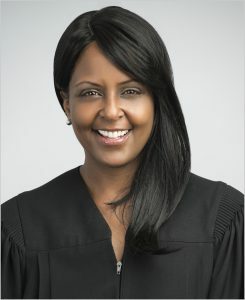 Lori A. Dumas, Philadelphia First Judicial District judge, has been appointed as a member of the National Council of Juvenile and Family Court Judges (NCJFCJ) Board of Directors. In 2015, she received the NCJFCJ Innovator of the Year Award, which honors an NCJFCJ member who is instrumental in justice for children and families and also advocates and advances its vision. She has participated in and facilitated a number of panels and trainings on human trafficking. Dumas previously taught criminal justice courses at Berean Institute, Harcum College, Eastern College and Temple University. For the past 12 years, Dumas has served as a judge for the Philadelphia County Court of Common Pleas, Family Division. She is also the presiding judge of the Working to Restore Adolescents’ Power (WRAP) Court. WRAP is a new court program of the Philadelphia First Judicial District Family Court Division that provides alternative specialized trauma-informed treatment to juvenile victims of human trafficking. Juveniles who have been arrested and identified as victims of human trafficking participate in WRAP through a pre-trial diversion program. Through WRAP cases are addressed by a multidisciplinary team including Dumas, a prosecutor, defense counsel and treatment providers. Dumas received her bachelor’s degree in sociology from Duke University and Juris Doctor degree from North Carolina Central University School of Law, where she was a contributing author to the Law Review. She is also a Georgetown University Fellow, specializing in crossover court matters.